RP29405 is rated 5.0 out of 5 by 3. Rated 5 out of 5 by maxtom from Great Repair Kit This is a full repair/conversion kit for my 1500 series shower valve and very easy to install. Just follow the directions and exploded view. A couple things to know the O-ring fits over the valve body behind the bonnet to align the sleeve and escutcheon to the valve body. Also, having installed an older kit which needed a new handle ordered separately, this kit came with a one piece handle assembly as well as a new showerhead and shower arm. Escutcheon screws at 5 &amp; 7 o'clock? Is there a conversion kit available for my Monitor 1500 with cover screws at approx 5 &amp; 7 o'clock? It also has a diverter button at 6 o'clock. Thank you for your question. We do not manufacture replacement trim for your 1500 series faucet with the screw holes at 5 &amp; 7. You will need to replace the valve to get a different faucet. We recommend the R10000-UNBX universal multi-choice valve to use any 1300/1400 or 1700 series trim. I have a 1500 Monitor unit installed in 1993. It has the holes in 1 and 7 position. You sell a cartridge (RP32104) that is the same part number shown for the 1993 unit. Will this cartridge work in the 1993 unit? If not do I use conversion kit rp29405? Thank you for your question. Delta Faucet model 1500 series with the screw holes at 5 and 7 cannot be replaced without replacing the valve too. Our current trim will not fit your valve. We recommend purchasing our Multi-choice valve which is model R10000-UNBX. This valve can be used with any 1300/1400 or 1700 series trims and can easily be upgraded to different trims without going behind the wall. 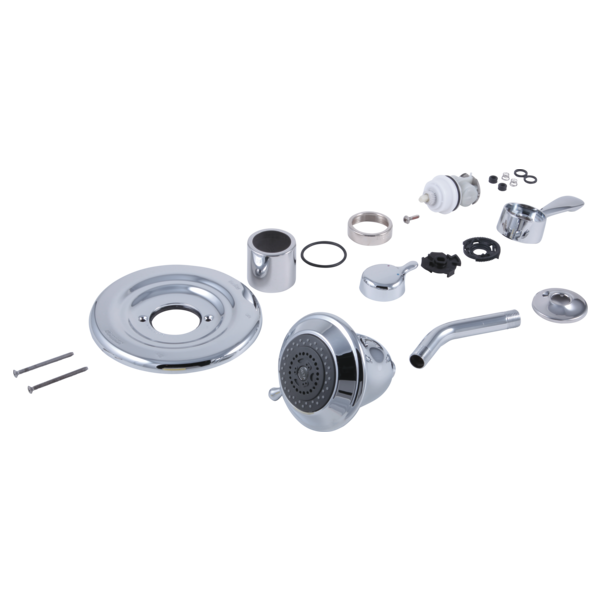 I need a 1500 to 1700 conversion kit in stainless or brushed/satin nickel (screws at 5 and 7 o'clock. Is this finish available? Thank you for your question. The replacement cartridge for your faucet would be the RP32104. Do I have to upgrade to 17 Series to fix a leaky 1500 Series shower? I believe the monitor I have is a 1500 Series (from the mid-90s). The screws are located at 1 and 7. The monitor has the separate temperature control at the end of the handle. The shower has started to leak through the shower head and I had a few repair questions: Is there a replacement cartridge that does not require me to convert the trim to a 17 Series? Are there seats, springs, and quad rings that could be used on the 1500 Series to fix the leak (and not replace the cartridge)? Or, do I have to use this conversion kit to upgrade my 1500 Series to the 17 Series? Looking for help in identifying the correct conversion kits and place of purchase for delta bathroom fixtures. We have recently purchased a vacation home and in process of remodeling. The two bathrooms have gold fixtures and we would like to replace with satin nickel finish. Need assistance in identifying the correct conversion kit for each. I have attached several pictures to assist with identifying the correct replacement. Pardon the condition, we took these upon purchase and they need a good cleaning. Please advise and thank you for your help.